읍성은 지방행정의 중심지가 되는 고을을 둘러쌓았던 성을 말한다. 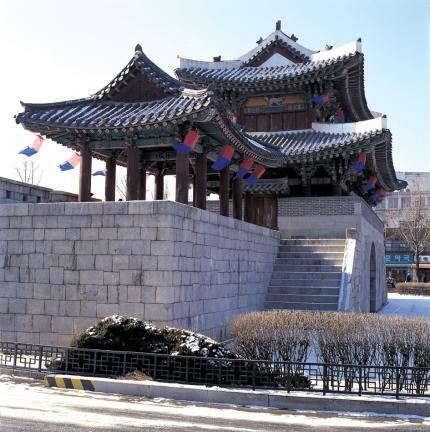 옛 전주읍성의 남쪽문으로 선조 30년(1597) 정유재란 때 파괴된 것을 영조 10년(1734) 성곽과 성문을 다시 지으면서 명견루라 불렀다. ‘풍남문’이라는 이름은 영조 43년(1767) 화재로 불탄 것을 관찰사 홍낙인이 영조 44년(1768) 다시 지으면서 붙인 것이다. 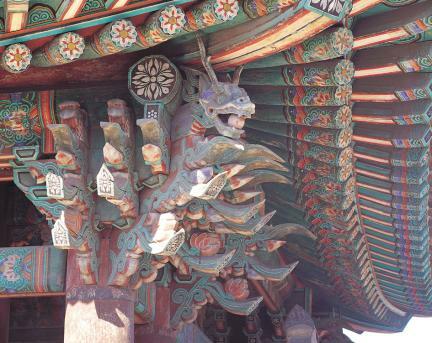 순종 때 도시계획으로 성곽과 성문이 철거되면서 풍남문도 많은 손상을 입었는데 지금 있는 문은 1978년부터 시작된 3년간의 보수공사로 옛 모습을 되찾은 것이다. 규모는 1층이 앞면 3칸·옆면 3칸, 2층이 앞면 3칸·옆면 1칸이며, 지붕은 옆면에서 볼 때 여덟 팔(八)자 모양을 한 팔작지붕이다. 지붕 처마를 받치기 위해 장식하여 짜은 구조가 기둥 위에만 있다. 평면상에서 볼 때 1층 건물 너비에 비해 2층 너비가 갑자기 줄어들어 좁아 보이는 것은 1층 안쪽에 있는 기둥을 그대로 2층까지 올려 모서리기둥으로 사용하였기 때문이다. 이 같은 수법은 우리나라 문루(門樓)건축에서는 보기 드문 방식이다. 부재에 사용된 조각 모양과 1층 가운데칸 기둥 위에 용머리를 조각해 놓은 점들은 장식과 기교를 많이 사용한 조선 후기 건축의 특징이라고 할 수 있다. 옛 문루건축 연구에 중요한 자료가 되는 문화재이다. 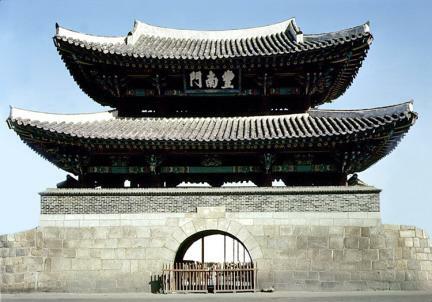 This was the southern gate of Jeonjueupseong and was called Myeonggyeonnu when the fortress walls and gate had been rebuilt in 1734, the 10th year of the reign of King Yeongjo, following the destruction caused by the second Japanese Invasion of Korea in 1597, the 30th year of the reign of King Seonjo. 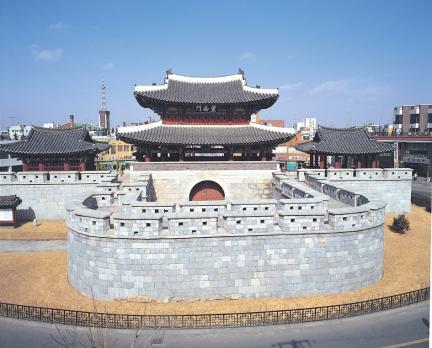 It was burnt down in 43rd year of King Yeongjo’s reign and was rebuilt and renamed Pungnammun Gate by Hong Nak-in in the following year (1768). 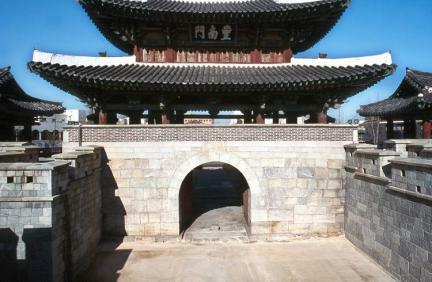 As the fortress walls and gate were removed following urban renovation during the period of King Sunjong, the Pungnammun Gate was much impaired. 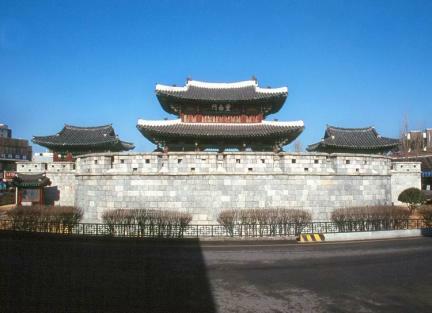 The present gate had its old shape restored by a three-year period of work from 1978. 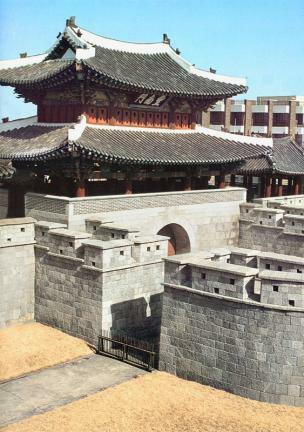 It consists of 3-kan (a unit of measurement referring to the distance between two columns) front space and 3-kan side space on the first floor and 3-kan front space and 1-kan side space on the second floor. 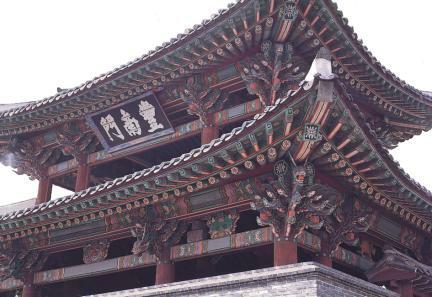 It has a hip and gable roof called paljakjibung. 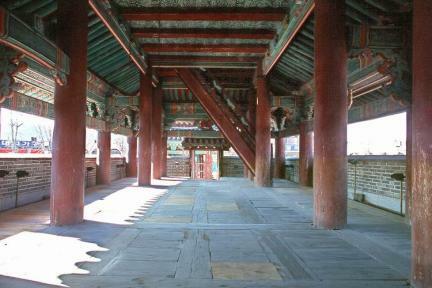 The gongpo (column-heads) that supports the eaves of the roof is set up only on the pillars. 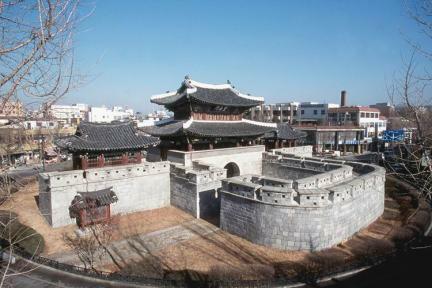 This is called jusimpo style of building. A special thing is that the width of the 2nd floor is suddenly reduced compared to that of 1st floor. 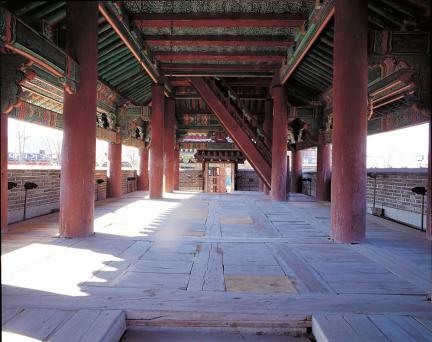 This is because the pillars of the 1st floor continue up to the 2nd floor where they are used as the corner pillars, a rare style in the construction of gate tower in Korea. 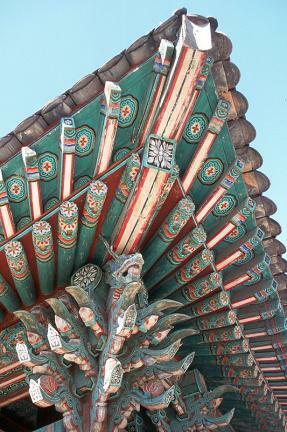 The carved shape of the column-heads and the dragons carved on the pillars between compartments in the middle of the 1st story are characteristics of construction in late Joseon, which used an abundance of decoration. 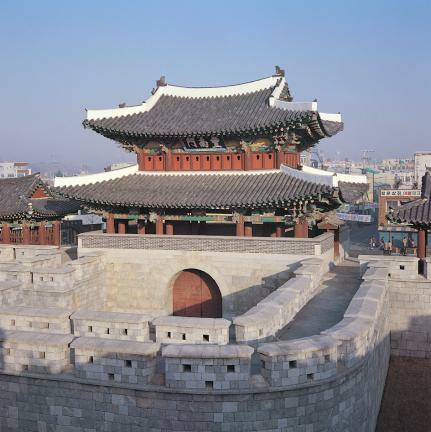 This is an important cultural asset for researching the construction of old gate tower.